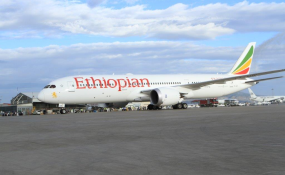 ETHIOPIAN Airlines is failing to repatriate funds amounting to US$18 million from Zimbabwe due to the shortage of foreign currency in the country. President Emmerson Mnangagwa was quoted in a local newspaper admitting that Ethiopian Airways is failing to access its funds from the country. The Zimbabwean leader was speaking from Addis Ababa in Ethiopia where he led talks with the local airline aimed at rescuing struggling Air Zimbabwe. "It is true, they touched on that and that it is worth about $18 million which is stuck in Zimbabwe, but that was not so much of an issue because they believe that if they establish a partnership with Air Zimbabwe, they will be able to get that money without any problems and in a very short space of time," he said. According to his spokesman, Mnangagwa promised to ensure that finance minister Prof Mthuli Ncube helps address the debt problem. Zimbabwe has for years struggled with foreign currency shortage, which have seen, among other challenges, companies failing to make foreign payments. Other foreign airlines operating in Zimbabwe that are failing to repatriate their money, include South African Airways which is reportedly owed about US$10 million. The Reserve Bank of Zimbabwe (RBZ) last year committed to make monthly payments of US$4 million to pay off the $150 million owed to international airlines.